When it looks as though things couldn't get worse for precious metal mining equities (GDX), that may be just the time to buy for contrarians. Not only are the junior miners (GDXJ) sloping to historic decade lows, but gold (GLD) bullion which has held up considerably well in comparison has been hit hard recently by short selling, bearish bank reports and margin calls. Now after this recent decline there is a palpable sense of panic and fear throughout the resource markets. This is the biggest decline since 2008 and 2003 when all the bad weather bears sold and missed out on 200% reversal moves in the mining indices. Don't make a similar mistake now. As I stated before, we should see a bounce. Hold on and add as we may be approaching a major bottom. I wrote recently that we may see a very powerful rebound as short covering and record investment demand returns to the precious metal sector. All of the summer soldiers have left the battlefield. Only the long term value investors remain and they couldn't be happier as there are bargain basement discounts galore throughout the resource industry. Mining is a difficult business that requires capital and meticulous operation management. Investors have been burned by the majors where we have witnessed a major decline in earnings and profits as costs soar. Barrick (ABX) came out with better than expected earnings recently and rallied the entire gold mining sector on increasing volume. Interesting this comes right after panic selling and capitulation. Long term value investors are able to get a dividend paying stock with cash flow at $2 below book value. Barrick announced incredible, better than expected numbers from its Cortez Trend properties in Nevada where cash costs are incredibly low. At the same time the Pascua Lama mine has become a disaster which they should probably just shelve and take a write down. The major miners are facing challenges with rising production costs from projects which are extremely capital intensive. In the past, they have done a poor job in their acquisitions into high cost mines in questionable jurisdictions. Don't get stuck in the past and throw the baby out with the bathwater. The major miners might not be as safe as some emerging junior producers, especially in mining stable jurisdictions, which have positive cash flow that could fund resource growth. Cash flow positive miners can use that capital to build additional resources without diluting shareholders. Gold prices have been rangebound for close to two years. Companies with poor operations will see costs continue to rise and some may in fact go bust and new owners will clean the operation up. For example, there is one operating gold mine in the Carlin Trend Nevada filing for Chapter 11 bankruptcy. Their costs and liabilities overran their profits. This mine may be an excellent opportunity for an experienced team to come in and take advantage of this opportunity. Eventually, the long-term uptrend in the miners will continue higher and smart mining companies with cash flow could actually gain value during this difficult market. 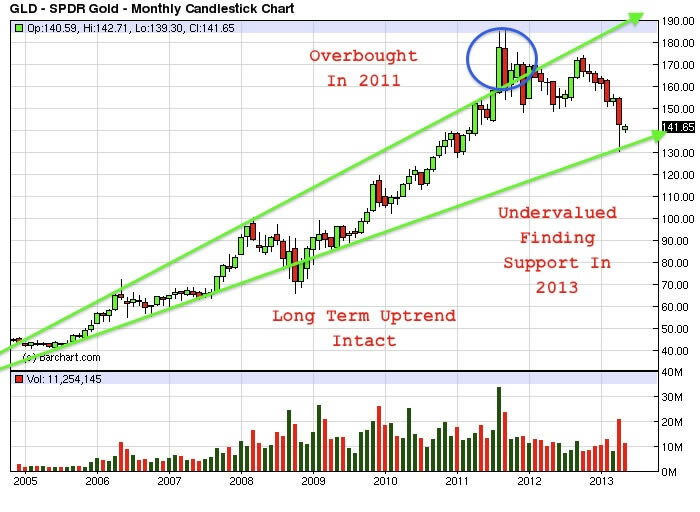 Investors must remember that this gold decline may be near a completion after an 18 month pullback. The margins may be small right now, but could change if gold makes a positive trend reversal. Mining costs could come down as labor and energy costs have decreased. Many are considering the average production costs in the industry at $1200-$1300 gold. This recent pullback is generating increased investment interest and physical demand. Premiums for gold and silver (SLV) bullion are reaching record heights as the pullback has unleashed incredibly strong demand especially out of Asia, India and Russia. Gold and silver may see physical shortages hit and that is when attention will be paid to the growing gold producers, significantly expanding cash flow. Demand for precious metals have soared on this pullback. We should witness a powerful bounce after the recent shakeout. This should boost the beaten down large producers and eventually the early stage explorers. The uptrend in precious metals is intact. I do not expect the downturn in precious metals and miners to last much longer. 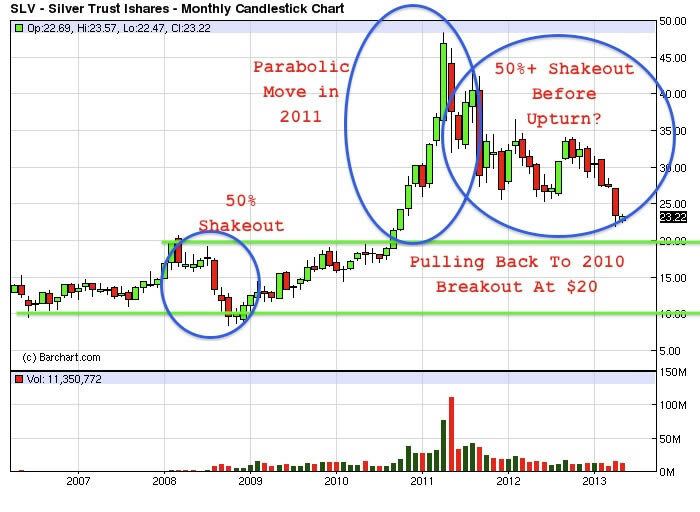 The miners could find support at the 2005 breakout. If this pullback in bullion is short lived as were all the corrections over the past 12 years, then we may see an exceptional move like those from 2003-2007 or 2008-2011 of possibly 200-400% from the lows. Gold has pulled back within 15% of the average cost of production at a time when fiat currencies are actively being debased by Central Bankers. The European Central Banks are lowering interest rates to record low and possibly negative yields. This will boost the physical demand for bullion and eventually the source of bullion, the miners. This undervaluation in the mining sector may not last for long. The majority of investors believe the gold miners are a losing proposition as the margins look slim especially if gold goes down. This is what many investors believed in 2003 or 2008 right when the downtrend in precious metals and the miners reversed. They went on to increase in value four to five times from those lows. The media may be telling you to avoid the risks in gold and silver (SIL) stocks. The greatest risk and bubble is with the manipulated dollar (UUP), yen (FXY), euro (FXE) and all of their sovereign debts. Eventually, long term precious metals and mining investors will reap the rewards of patience and rational thinking as gold and silver resume their long term uptrend. In a recent video update I highlighted the technical reasons why we may be witnessing the end of the gold and silver correction. We recently witnessed a historically volatile month of April in gold and silver. This was the greatest panic in gold in over 30 years and is evidenced by the gap lower a few weeks ago. Gold and silver may look to close the gap between $1,350 and $1,550. Gold impressively closed above $1,400 and made a hammer pattern indicative of a potential bullish reversal after an extended consolidation. This made many of the shorts cover including Goldman Sachs. Gold has been in a basing pattern since August of 2011 when we witnessed a parabolic move during the U.S. debt crisis. At that time we urged caution, while the same banks that are bearish now forecasted higher targets. Savvy investors should use these bearish bank reports as a contrarian buy signal for gold, silver and the miners. The technicals show a potential bottom and that the long-term uptrend is intact. None of the fundamentals warranted this recent gap lower except panic and fear instilled by the same players who may have been short. This widespread negative pessimism may indicate that the bleeding for precious metals and wealth in the earth may be coming to an end.